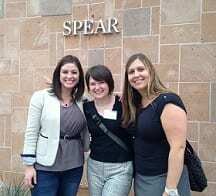 I spent another amazing weekend in Scottsdale at Spear education with some fellow dental nerds, Dr. Mayer and Dr. Hedrick. We spent three days learning even more about occlusion and how we can help our patients with headaches, TMJ pain, cracked teeth and worn teeth. We had a great time during the hands-on part of the class, mounting our own models and making appliances for each other. It’s important for us to experience dentistry as a patient to remind ourselves what it feels like on the other side of the chair. I’m thrilled to have the opportunity to nerd out with these two great dentists this weekend.